The continuity relationship between Marvel's television and film output in recent years can be described as tenuous at best. And that's been mostly fine - the Marvel movies of recent years have been relatively insular, with little need for their events to impact the likes of SHIELD or the Netflix shows. Avengers: Infinity War is an altogether different beast, however. If you're one of the many, many people who've helped contribute to Infinity War's insane rise at the box office over the past 10 days (and if you haven't, why are you reading past the spoiler warning? Shoo! ), you know that the movie climaxes with a universe-shaking event: Thanos, armed with the might of all six Infinity Stones, snaps his fingers, setting into motion an apocalyptic purging of half of all life in the universe. Even as the relationship between Marvel film and TV has become more distant (and with the TV heroes left out of Infinity War's smorgasbord of starring characters), that isn't the sort of event any one of these shows can ignore while still realistically claiming to be part of the "it's all connected" Marvel Cinematic Universe. 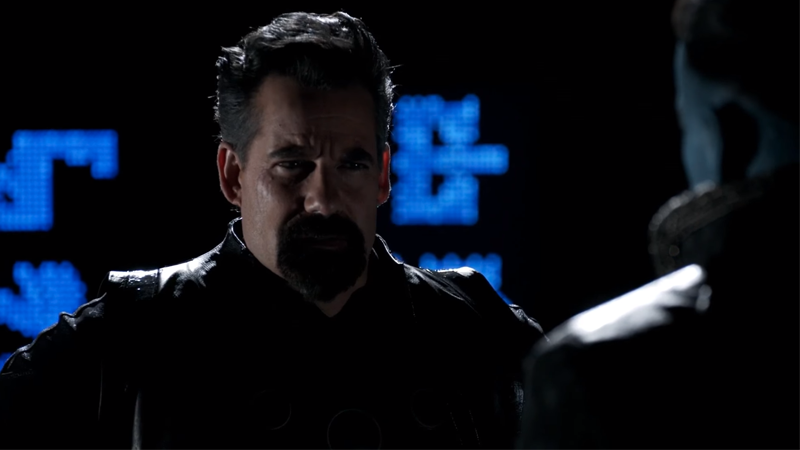 And in last week's episode of Agents of SHIELD - whose last real connection to the events of the movies was a half-hearted ignoring of the Sokovia Accords established in Captain America: Civil War nearly two years ago - the show set itself on an inevitable collision point with Infinity War's dramatic ending. There are just two more episodes to go in SHIELD's current - and potentially final - season, as the team has found themselves coming face to face with an alien arrival on Earth. Not in the form of Thanos or his Black Order directly, but instead the Confederacy, an amalgam of alien races lead by the Kree demanding an exchange of resources - Gravitonium and the Inhuman population of Earth - for protection from a great evil to come. "The One Who Will Save Us All" finally confirmed that that great evil is none other than the Mad Titan himself - as in, they actually directly said his name and everything - and then it confirmed that (offscreen, of course), Thanos is attacking the Earth right now. 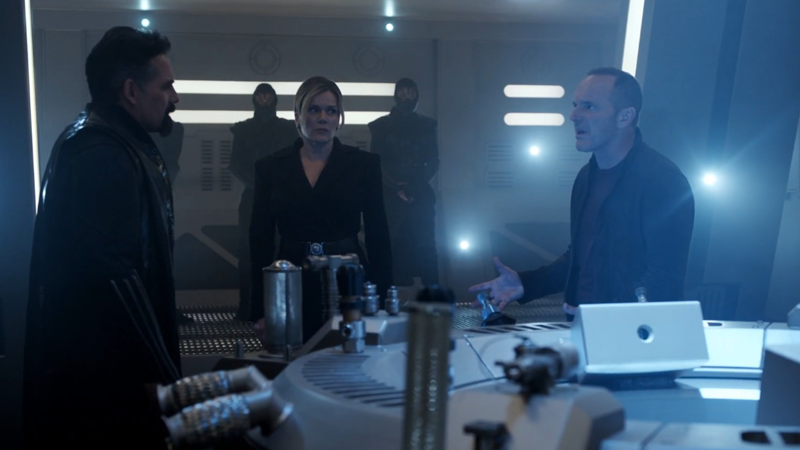 The episode prior saw Daisy offhandedly mention "weird stuff happening in New York", which means this current reference is more likely a deliberate remark as to the Black Order's assault on Wakanda during Infinity War's climax, rather than the skirmish Iron Man, Spider-Man and Doctor Strange have in the Big Apple. Which means that, give or take, there's probably only a couple of hours at most before Thanos raises his hand and disintegrates half of the cosmos. Which would line up with the season finale of SHIELD... and for us to end the season potentially watching a good chunk of the cast get turned into itty bitty bits of dead dust. 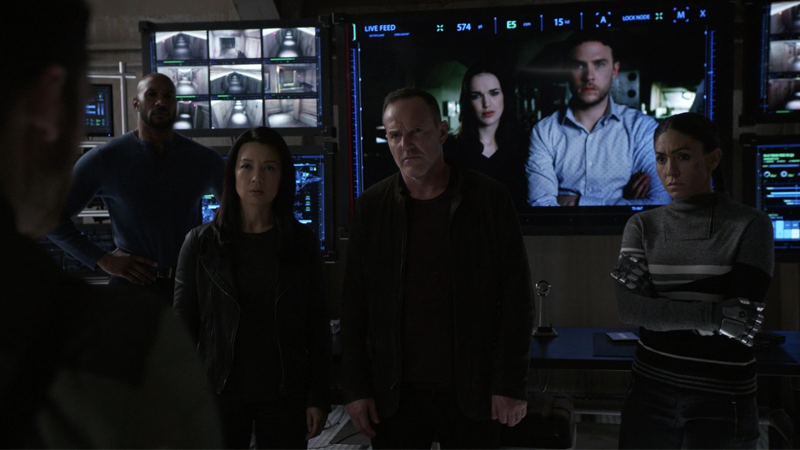 There's no reneging on that connection at this point - at most, SHIELD could conveniently leave its main cast intact as lucky survivors. But that would feel a bit cheap, and even if the show did that, it would still have to reckon with half of Earth's population just being gone. Even if the show stretches out the next two episodes to avoid actually showing the moment itself, it's still jammed into a collision course with the events of Infinity War at large. It's really happening, and that's honestly great! It's a reminder that after years of half-hearted distancing, that there are ramifications that transcend the film and TV sides of the Marvel Universe. The last time SHIELD was affected this much by the movieverse, it was the SHIELD-Hydra twist in Captain America: The Winter Soldier, a twist that revitalised a flagging show in the back half of its uneven debut season. Five years on, SHIELD is far from needing revitalising on that level - it's gone on to become its own thing in the MCU, free to tell its own fascinating stories that aren't beholden to the whims of movie storylines. But should the show get a sixth season (as of writing, it is still on the bubble, outside of a potential mandate from upon high as happened with season five), it's exciting to ponder just how SHIELD will reckon with the events of Infinity War - especially given that a sixth season would be almost half over by the time Avengers 4 is hitting theatres to undo Thanos' horrifying quest. That's a lot of time to have to deal with a world where half of its population, and perhaps even half of SHIELD's primary cast, just vanished into the ether. But it's an interesting gauntlet (ahem) for SHIELD to have thrown down heading into the final episodes of the season. Now, perhaps the question becomes this: Will any of the Marvel Netflix shows, with connections to the movies that lean toward the comical side of tenuous, follow SHIELD's bold move?